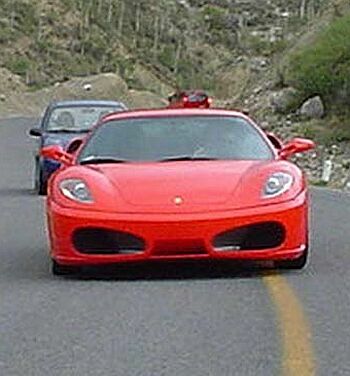 These photographs, purport to show the new Ferrari 360 Modena replacement on the open road, offering a close-up view of the new model, with its many Enzo-influenced styling cues. Earlier this week the new mid-size sportcar, expected to be known as the F430, was presented to dealer representatives at Maranello. The Coupe is likely to debut early next year at the Detroit Motor Show, with Spider and Challenge Stradale versions following during the summer. The evolutionary shape, it will continue to use the 360 Modena's chassis, is much more bulbous and aggressive than its predecessor, as Ferrari seek to put daylight between this model and Lamborghini's Gallardo. The bigger wheel arches will enable larger 19-inch starfish-style alloy wheels to be fitted as standard, carbon-ceramic brakes will also feature, as will an increased track width at both the front and rear. 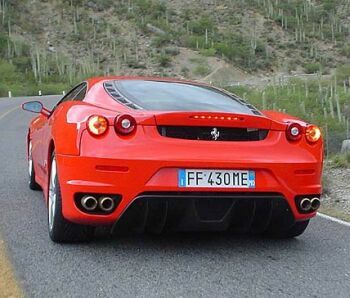 Like the Enzo supercar, the F430 will make greater use of F1-developed technology. The front bumper will have re-profiled lateral air inlets to supply more air to a new, larger capacity engine, while the rear air scoops will become much more prominent. New headlights are mounted in Enzo-style angular units. The highly detailed rear of the car will feature modified openings around the tailpipes and a new diffuser design. The optical units and rear grille treatment is Enzo-inspired. The new engine is a development of the Ferrari-designed Maserati 4.2-litre V8 unit, which has been bored out to 4.3-litres. An output of between 480-500bhp will be achieved through further optimising the intake and exhaust gas flow. The quad rear exhaust pipes will each have a reduced exit diameter and a tapered design.